The Intlock team is Texas bound for the next big SharePoint and Office 365 conference. The Intlock team will be in Austin, Texas from February 21st to the 24th for SPTechCon (otherwise known as the SharePoint Technology Conference.) The team will be exhibiting CardioLog Analytics at booth 501. The event will host 80 technical classes and tutorials presented to help those utilizing SharePoint technology and maximize their effectiveness with it. SPTechCon Austin will feature the first conference sessions on SharePoint 2016, the next release of SharePoint expected early next year! More resources will be provided on working with SharePoint 2013 and Office 365, with practical information to put to use right away. SPTechCon will offer classes and tutorials for IT professionals, business decision makers, information workers, project managers, and developers. Each presenter at the conference will be a true SharePoint expert, with many drawn from Microsoft’s tech teams or from outside authorities with Microsoft MVP status. 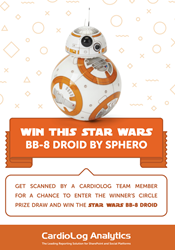 The Intlock team will also be raffling an exciting prize - a Starwars BB-8 DROID. Get scanned by a team member for the chance to win! One of Intlock's key strategies is partner alliances. Intlock believes that working together with partners is crucial for cost effectiveness and ease of implementation. Partner alliances shorten implementation times and enable the adaptation of Intlock's products to any technological environment a customer may have. Parties interested in a partnership with Intlock can contact the company: contact here and someone will gladly be in touch.